Menorca (also known as Minorca) belongs to a group of islands in the Mediterranean Sea known as the Balearic Islands. Menorca along with Mallorca, Ibiza and Formentera are a two hour flight away from most international airports in the United Kingdom. Ibiza and Mallorca are the two Balearic Islands which really stand out, Ibiza because of its nightlife and Mallorca because of its mass tourism. We have a full Menorca tourist guide and a webcam page. 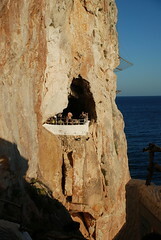 Image below: Is this the most unusual bar in the world (Caves of Xoroi)? Menorca is a family friendly holiday destination with Mahon (Mao) as its capital and Ciudadella (Cuitadela) as its largest two centres. Menorca Airport is located in the south-east of the island very close to the island’s capital Mahon. The main tourist resorts on Menorca include Port Addaya, Son Parc, Arenal d’en Castell, Fornells, Es Castell, Cala en Porter, Santo Tomas, S’Algar, Son Bou, Cala en Bosc and Cala Blanca. Santo Tomas, S’Algar and Son Bou are the main tourist centres for families with children owing to the beaches, amenities and fine range of accommodation. Mahon being the largest centre of the island is the best place to go after dark to experience the Menorca nightlife. Akelarre is a trendy live music located on the harbour front in Mahon and is famous for its cocktails and Thursday evening jazz and blues sessions. For more information you can visit their web site at http://www.akelarrejazz.es/ or give them a ring on 971 368 520. The exact address is Moll de Ponenet 42. H20 is a modern club attracting mainly the over 25’s with a good choice of cocktails and music. H20 is only open from midnight until 4AM every Friday and Saturday. H20 is located on the Moll de Llevant in the harbour of Mahon. Latitud 40 is another contemporary nightclub in Mahon and is located on the harbour front. Latitud 40 is open all year round and attracts holidaymakers and locals alike. La Falua is a great bar to visit and enjoy some exotic cocktails and music. La Falua is located on the Moll de Llevant in the harbour of Mahon. La Mar is located on the Moll de Llevant 75 and is well known for its pricey cocktails. The telephone number for the La Mar Bar is 971 361 754. Mambo is a favourite for holidaymakers and locals alike and is also located in the harbour of Mahon. At Mambo there are snacks and ice cream on offer all day and in the evening there music and cocktails to be enjoyed on the terrace, as well as some fantastic harbour views. Tse Tse is located at Costa des General 14 immediately after the ferry terminal in Mahon, a great place to relax on hot days just before embarking or disembarking. In Mahon Town itself worth visiting are the Ars Café, Café Mo Blues, Discoteca Si and Sa Terrassa es Claustre. Near the airport is the small town of San Climent where you will find the oldest jazz venue on the island. Open for the peak tourist season from April through to October on Tuesday nights from 21:30. The Jazz Club Sant Climent is located on the Carrer Sant Jaume 2 with a contact telephone number 971 153 418. The Grill Out Lounge also near the airport is the place to especially if your flight has been delayed. Here you can chill out listening to different types of music until one in the morning. In the seaside resort of Cala En Porter the place to spend the evening at is at the Caves of Xoroi (see image at top of page). Set up high above sea level this venue is open for drinks during the day and a disco by night. Located on the Ctra Nova 75 with a contact telephone number of 971 377 326 or for more information you can look on their website http://www.covadenxoroi.com/. Asere is a salsa club located in Ciutadella in the harbour area. The club is open daily during the summer and on weekends in the winter. For more information you can contact them on 609 672 610. Jazzbah is located on the Pla de Sant Joan in the Ciutadella Port and is considered to be one of the hippest night spots on the island and is popular with tourists and locals alike. Here you will find regular jazz performances and other music types by from all over Spain as well as resident and visiting DJ’s. The chill out room and open terrace give it that little bit extra. Space nightclub opened its doors on the 15th of June 2012. “Menorca’s nightlife will never be the same again after Friday 15 June 2012 when Space Menorca opens on the port of Ciutadella. Transporting the magic and essence of Ibiza to its neighbouring island, Space Menorca brings a new concept of sophisticated nightlife to the island. Just like Space Ibiza, which has been awarded ‘Best Global Club’, the key element will be great music to suit a range of modern tastes. The new club promises the most powerful sound systems, advanced LED technology and the latest video mapping software, enhanced by some of the best national and international DJ’s. However, despite these similarities, Space Menorca will have a personality suited to the characteristics of the island. The former building and terraced gardens have been completely renovated to combine the aesthetics of the original rustic exterior with a minimalist interior that oozes Mediterranean charm. With a maximum capacity of 600 people, Space Menorca is divided into three areas: an open entrance hall and bar to meet friends, the main club room dedicated to dance music and a large outdoor chill-out terrace upstairs with lounge seating and two bars to enjoy drinks in a relaxed environment. There is also a VIP zone where tables can be pre-booked. Space Menorca is pleased to announce that resident DJ for 2012 will be Gelabert who originating from Menorca has become an internationally acclaimed DJ, record and music producer, having worked at some of the biggest clubs and music festivals in Miami, including the Ultra Music Festival of Miami as well as Cosmos Sevilla, Club Catwalk and many more. Also not to be missed are the ‘Delicious’ party nights held every Saturday, hosted by John Alcalde, aka Spider, as resident DJ for the evening together with several guests and performers to be announced soon. Space Menorca will be the group’s second franchise worldwide after Space Sharm (Sharm el Sheikh, Egypt) and is part of a new era of Space Ibiza with additional franchises planned for Brazil and Dubai. Pla de Sant Joan, Ciutadella Harbour. For more information, email: info@spacemenorca.com. For bookings and VIP tables, telephone: 627 802 047. Admission at the time of writing this article is about €20. More bars, clubs and pubs worth spending an evening at in Menorca town include the Sa Clau Jazz Club, Si Vens Café, Es Vaporet, the Limoo Bar, Bar Ulisses, La Margarate and the Claustre de Seminare. Scandals is located in the sea side resort of Es Castell on the Carretera San Felipe. Scandals is a sports pub with full size snooker and pool tables and large screen televisions for those international sporting events. Food is served all day ranging from tapas during the day to a full a la carte menu in the evening. To book a table you can call them on 971 365 313. Sagitario is located in the centre of Es Castell and is the place to go to for Fish and Chips on a Friday as well as their curries and salads. Es Cau is also located in Es Castell and is a live music bar with a difference as the audience is invited to bring along their own instruments. Es Cau is located on the Cala Corb and is open daily from ten in the evening. The Tonic Night Club was founded in 1970 and plays music from all eras and is known for its themed evenings of the 70’s, 80’s and 90’s. The Club Escola Menorquina is a great evening out for the whole family. “A phenomenal performance that shouldn’t be missed! The riders at the show perform on traditional Andalucian horses that are specially trained the Menorcan way. The result is a truly magnificent performance showing the connection between man and beast. A highly entertaining and fun evening out, the show can be seen on Wednesdays and Sundays at 8.30pm, tickets cost 12.50€ each and children under 12 years old are free. Carretera Cala Galdana, Ferreries Tel: 971 155 059 or 971 373 497. In Son Bou the Mai Tai Cocktail Bar is worth a visit. The only casino on the island is located in Mahon. Here you can play black jack poker or roulette, enjoy a drink at the bar and dine at the restaurant. Passports are a requirement and an admission of €3 is payable for first time visitors. Page Summary: Although Menorca cannot be compared to Ibiza and Mallorca in terms of size, visitors or infrastructure, Menorca more than holds its own to keep the whole family entertained.